As a runner you need a balance of flexibility for every turn and change of direction as well as cushioning for all those miles you're going to be clocking up. 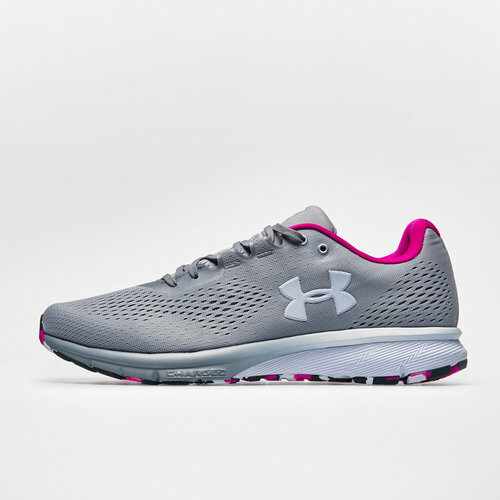 These Under Armour UA Ladies Charged Spark Running Shoes in Metallic Silver, Graphite and White can provide both. These lightweight running trainers have been engineered with a two-tone mesh upper construction for increased ventilation when you're really feeling the heat. The firm external heel counter adds support for long runs whilst keeping the back of the foot locked in place. The moulded, high-rebound EVA sockliner provides a comfortable and responsive run whilst the Charged Cushioning midsole uses a compression-moulded foam for an even better response and offers durability. These trainers are designed with sheer comfort in mind.